The new product Amino 16 with B & Zn is the result of an excellent combination of Amino 16, organic amino acid fertilizer, biostimulator, Nutrition & Plant Growth enhancer and High Quality micronutrients of Boron and Zinc, a valuable contribution to plant nutrition, particularly for citrus fruit, olive trees and field crops. It is a highly effective product that has derived from an innovative way of production and composition and was created to optimally serve any specialised crop need. 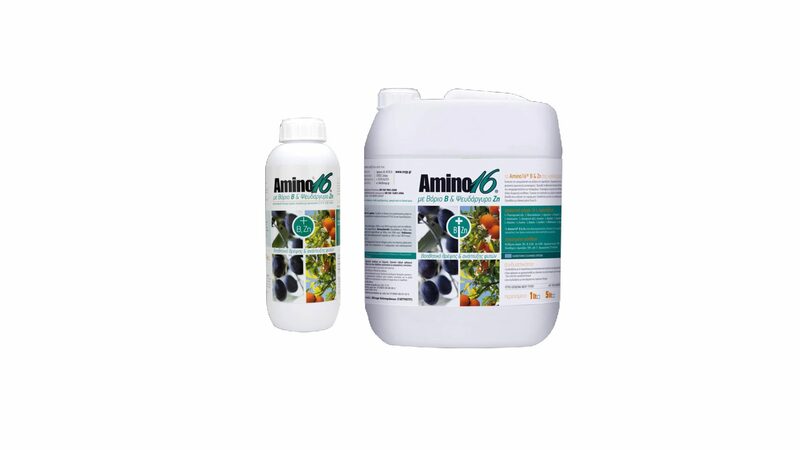 The amino acids contained in Amino 16 help contribute to the more efficient absorption of Boron and Zinc by plants and thus help them to have a beneficial effect to crops that need them. Citrus fruit: 500cc in 100It of water before flowering, 2-3 applications of 500cc in 100 t of water after fruit set. Other crops: 4-5 applications per growing season with 500cc in 100lt water.